I am in love with this dress! The fabrics are called Maisie from Anna Griffin. They are so fun and whimsical! 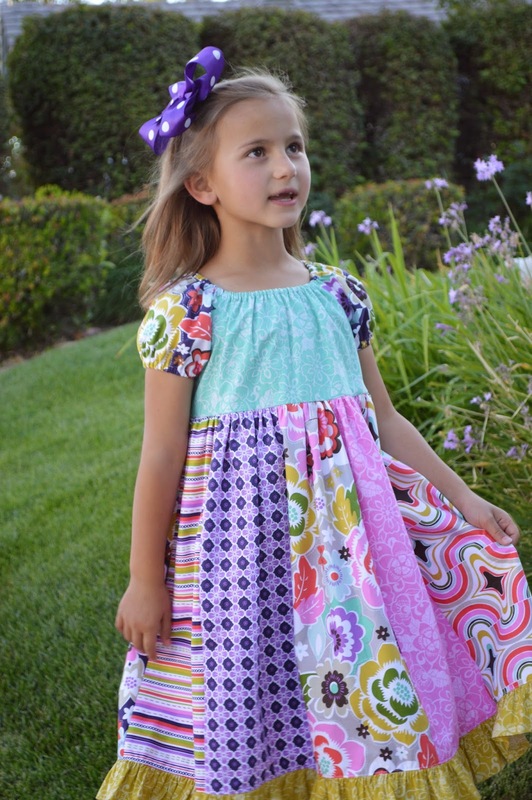 This dress is the perfect dress to sew if you are like me and collect fabric in 1/4 or 1/2 yard increments. I rarely go fabric shopping and purchase 3 yards of every fabric I love. 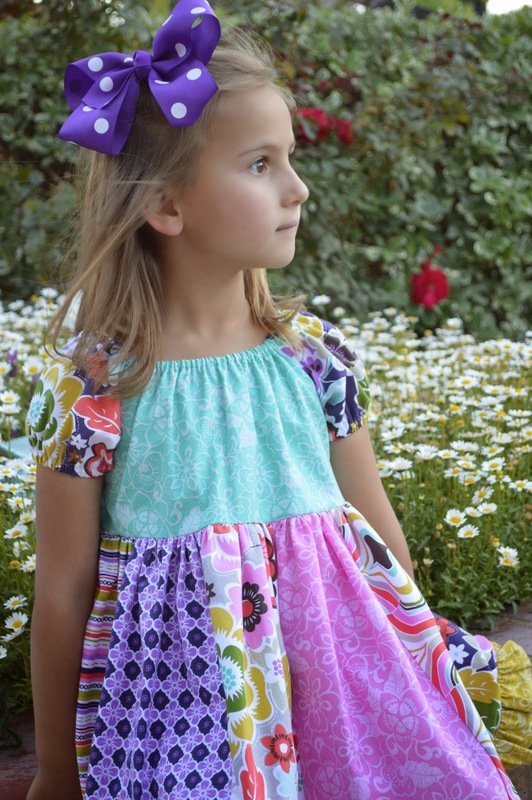 To make this dress you need a peasant dress bodice pattern - or make your own. 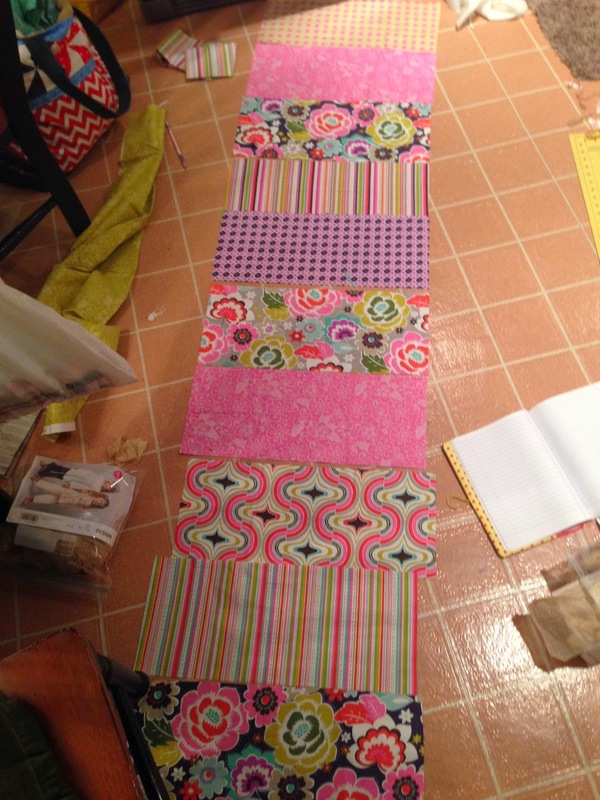 I like to wait until the patterns are $1 at JoAnn's fabric then I go crazy! 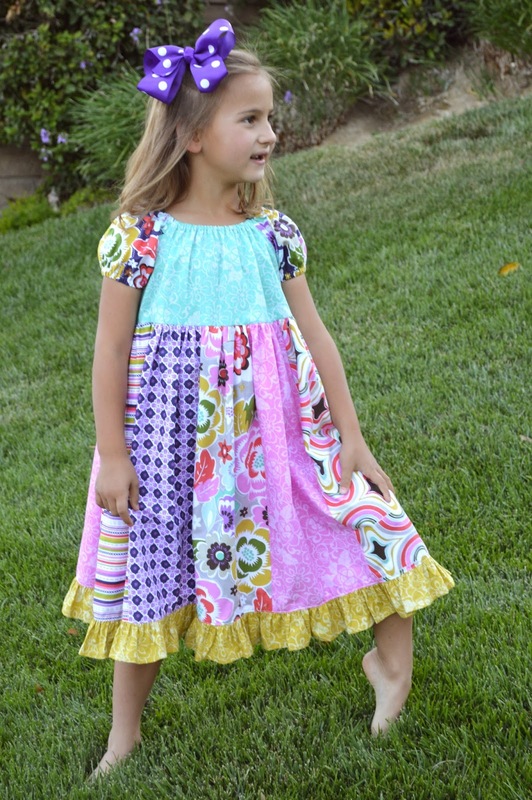 Peasant dresses are perfect if you want a fast way to construct a dress - no buttons or zippers or lining - Yippee! Follow the directions on the pattern for the bodice. I used ones print for the bodice and a different print for the sleeves. Here are the measurements for the skirt. This is for a size 6-8 girls. There will be 5 fabrics on the front and 5 on the back. Sew with 1/4" seams and then zig zagged each seam to prevent fraying - time consuming yes. Sew the rectangles together to form a giant circle that will be the skirt. Press seams to one direction. Sew a gathering stitch along the top of the skirt piece and fit it into the bodice matching side seams. Sew along gathering stitch, zig zag, then press. For the bottom ruffle, cut (4) 3 1/2" x WOF strips. Sew them together end to end, press the seams. Sew a rolled hem on one of the edges. I cheated and used my gathering foot - hoping I would not run out of ruffle - it worked! This saved time because as I didn't have to fit the ruffle into the skirt - I could use the ruffle like trim instead. The ruffle foot is one of my favorites! I had to make a little seam on the side where the 2 ends of the ruffle meet - but it blends in OK. After the ruffle is sewn on, press the ruffle and top stitch.